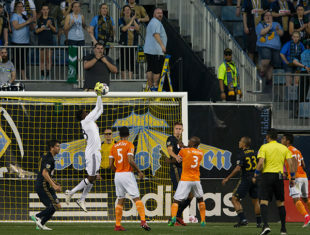 The Union picked up three points in hot and humid Houston. Final score: 3-1. They’re now in 7th place in the East. Get pumped! Reading United is hosting the PDL National Semifinals this Saturday night. They play The Villages S.C. The 2018 Philadelphia International Unity Cup is coming up. Here’s a sneak peek of the 52 teams. Bradley Wright-Phillips becomes the fastest player in MLS history to reach 100 goals. Yeah, but he’s no Jay Simpson. David Beckham’s Miami stadium site damaged in golf cart fire. The Whitecaps will send a training compensation check to Alphonso Davies’ youth club in Edmonton. Whitecaps brass say they’re on board with FIFA’s rules for the system. That might get some attention in the rest of MLS. Toronto F.C. 3-0 Ottawa Fury F.C. Juventus F.C. fell to F.C. Bayern Munich last night at the Linc, 2-0. Bayern’s other MLS teen signing: Chris Richards. It took Manchester United 26 penalties to beat A.C. Milan. Sports Illustrated looks at the Ozil fiasco. Putin’s World Cup gift to Trump contains transmitter chip by design. A ref’s perspective on penalizing exaggeration. Juventus beat Bayern Munich last night, you have that backwards. Good for the Whitecaps to pay Davies’ youth club some training compensation. Hopefully the rest of the MLS follows suit to give youth clubs a financial incentive to develop players (and not just win youth tournaments). I would like someone to work through the math of running a stand alone youth club. So Davies’ youth club gets a payment of $140K Can$. So does that mean his youth club does not have to charge fees anymore? Probably not. How may youth players do a club have to develop into players EVERY YEAR that command solidarity payments before they no longer have to charge the fees. It is probably a large (unobtainable) number. It all comes down to economics. Please, someone make the case for me that solidarity payments will carry all of the youth clubs in this county. All? No. But, the better clubs will. This country is like a “sleeping giant” to barrow a quote from Yamamoto. Conceivably the US could become a factory of soccer talent. Does that mean Every soccer club will succeed? No of course not. That’s just the way things go. The most successful one’s will reinvest their early gains towards coaching and upgrading training centers, pitches etc. Some will make bad management decisions, bad investments, and fail. But there’s definitely potential there because it will now be spurred on by the profit. Look at what that one group did by connecting a USL club to multiple youth organizations. They created a pipeline to the Pro’s without a MLS club. I’d expect to see more of this. We won a game! We won a ROAD game!! We’ve won TWO road games in a row!!! This is the Union right? It took a soft, soft red card, but I’m not looking a gift-horse in the mouth. Now for 1 1/2 weeks of prep to do it again in Portland! Jack has a good point, maybe the easy fix is pay the parents back all the fees they paid to the club, plus ten percent of the ten percent the youth club received. As the youth club gets a reputation for developing players they can transition to no pay to play. If you haven’t seen it, BWP goal celebration is one for the ages. impressive achievement and celebration. Supposedly a couple teams are looking to trade for Sapong? This is to good to be true. I was more focused on the teams wanting Sapong part. But I guess the Adi thing would be a bonus if they took C.J. back. It would be interesting.